Effective communication with your teen… sounds easy enough, right? In order to effectively communicate with children, we must communicate in a way that relates to the age and interest of the child, as well as to use communication styles and behaviors that are age appropriate. With that said, to begin to effectively communicate with your teen, we must first understand a little about how they communicate. At adolescence – typically ages 12-18 years old, our teens appear to be interested in talking in depth about themselves and their relationships with others. They strive to understand who there are, who they are becoming, and what others think and feel about them. They also begin to spend less time with their parents and more time with friends, OR the just plain want to be left alone. We believe that anyone with a teen can relate to one or possibly all of the above to be true. If you ask my teen, being an adolescent is difficult. You’re at the awkward age where you’re too old for some things, but not old enough for others. You’re dealing with mood swings, relationships issues (friends, parents, usually your first broken heart occurs during this age, etc. ), peer pressure, all of this while trying to keep up on your studies in school and/or keeping your part-time job. They feel they are too different from us as adults and find that it is hard to talk to us about anything. If this is true, how can we effectively communicate with them? Pick your time wisely – When talking with your child make sure you have an adequate amount of time to listen to them in return. (Example, you should not begin a conversation with them if you’re on your way out, or getting ready to make a phone call, etc. Let them know you have an open door policy – Assure your child that they are able to come speak to you about anything, without them feeling like they are being judge or reprimanded. Listen – You should listen to them entirely. Even if you may not like the topic or disagree with what they are telling you, take the time to listen and try to keep an open mind. If your child approaches you with a problem, please remember to allow them to complete their thoughts and express their feelings before you interrupt them. Collect your thoughts prior to responding – Before responding make sure that you have your thoughts together. It is completely ok and appropriate to tell them that you will need to get back with them with an answer or response. You may also let them know you will need this time to think about it. Avoid attacking character – Avoid attacking character, name calling, or derogatory statements. Try not to contradict your child’s statement immediately, even if you believe they are incorrect. 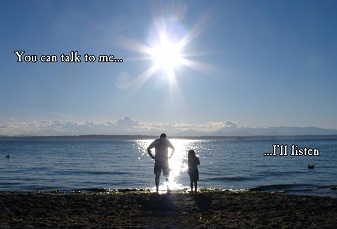 It has been said that one of the most important experiences we as adults can provide our children is by talking and listening to them. We completely agree. Never feel afraid to let your child know you are concerned about them as well as how much you love them. To schedule an appointment with Ben Novell, MS, LMFT,LPCC, Janelle Novell, LMFT, RPT-S or any of our therapists, please call 951-252-9911.